Its most common symptoms are white, painless patches on the surface of the tongue. However, white patches on the tongue aren’t an immediate indication of thrush, not unless you know how to differentiate them from other conditions. Read on to find out the differences between thrush-caused patches, and other types of white tongue. When the candida albicans colonies in your mouth grow to massive numbers, you get those nasty-looking white patches that are commonly associated with thrush. This is the most common symptom associated with oral thrush, though it may be present in other diseases, too. It’s possible to have a white tongue without having thrush. When that happens, you won’t notice the thick, cheese-like coating, but a slightly thinner, more transparent white substance on the surface of your tongue. This is caused by the bacteria and other debris in your mouth, and it’s usually an indication of less than perfect oral hygiene. These patches will go away without pain if you scrape your tongue while brushing your teeth. If you get a single white patch in your mouth that can’t be scraped away, that’s probably leukoplakia. It’s usually caused by drinking or smoking too much, and it’s important to consult your doctor regularly, to make sure it won’t grow. While it’s generally harmless, there’s a chance it might turn cancerous, years after it first appears. 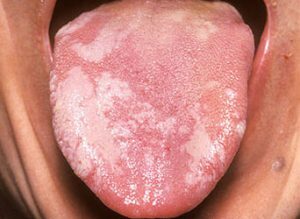 White streaks on your tongue may be a sign of oral lichen planus, a long-term immune disorder the cause of which isn’t clear. Mild cases don’t require treatment, since they’re not painful. However, more severe conditions can be treated with antiseptic mouthwash or steroids. White tongue may also be cause by other conditions, such as syphilis, in which case you’ll need to treat it with antibiotics. Geographic tongue, cancer, and AIDS may all lead to tongue discoloring or patching, so it’s important to consult your doctor as soon as you notice the first symptoms. In some cases, a white tongue may be a symptom of a serious disorder, so it’s best to take action and see your doctor if you suspect something is wrong.